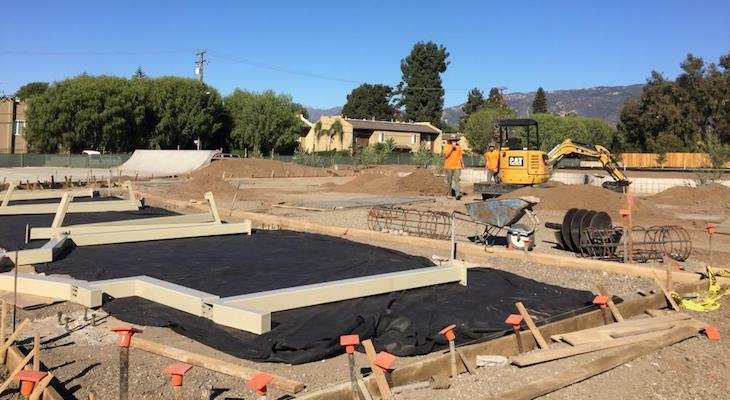 Construction is in progress on the City of Goleta’s newest community park! The park is located on four acres in Old Town at Hollister and Kellogg Avenues. Check out our behind-the-scenes videos (November 2, September 18 and August 8) to see the progress on this park. We anticipate it being open to the public in early spring 2019. At the City Council meeting on October 16, 2018, the park was given the name Jonny D. Wallis Neighborhood Park. Named after one of one of the City of Goleta’s founders and an advocate of Old Town, parks and open space, Goleta’s newest park will be an asset for all members of the community. Its wide range of amenities will appeal to all ages. Those amenities include a multi-purpose field, basketball court, handball court, concrete ping-pong table, bocce ball court, pickleball court, playground area, perimeter walking path, fitness nodes with exercise equipment, picnic areas and skateboard plaza. Follow us on Facebook for more behind-the-scenes videos! Click here for more information on the park. The Artistic quality of G Rask's music is quite impressive, thanks AWHITEGUY for turning me on to this, will be making sure it get plenty of air-play. All this time I was not aware that local Hiphop had a current movement. Music normally leads to a positive outcome, and these kids have created an outlet. This is great! I remember local punk bands from IV like Threatened Hope, LatchKey Kids, and members of RKL. On the Rap Side Goleta Had, Lil' Indianz, Mr. Olde, Shaka, Poetic Justice Production Crew, DJXTEK.... Those 80's and 90's kids from Old Town Goodland. Much Peace and Love! This park is a wonderful thing, and very optimistic of Goleta to build it. Thank you, Goleta! Day and night supervision of this park, from the beginning, must be done. Don't let crime get a foot-hold. No used needles please, like most of the parks in Santa Barbara! Preserve the beauty and safety of this great effort. Edhat calls the apartments across the street from this park "Goleta Senior Apartments" (in an article about a gas leak). Here are those senior apartments: https://www.youtube.com/watch?v=PUz-o8BqR3s Goleta has a gang problem. Those that actually have to live in it are too afraid to speak up. This park is going to be a disaster. Don't be ridiculous, There hasn't been a gang issue in the area for well over a decade. I live in the area, so please don't speak for me.